‘Carol’* has been caring for her husband, ‘David’* for many years due to his heart and related health problems. David has been increasingly having problems with moving about and looking after himself. Carol herself was recently diagnosed with dementia and as they have continued to care for each other, both have needed extra support. Their family have had difficulty looking after them as they have their own work and family commitments, in addition to looking after their parents. After meeting with a Dementia Advisor from the Bromley Dementia Support Hub Carol, David and their son and daughter, now have more help to live as well as possible with dementia. The Dementia Advisor from the Hub helped Carol and David apply for Attendance Allowance, which has helped them pay for care (taking medication, washing and dressing, household chores) in their own home. The Dementia Advisor also helped Carol and David apply for Blue Badges and since these have been granted, it has become easier for family members to get Carol and David to appointments. Carol and David regularly attended the Memory Lane Dementia Café, where they took part in activities and met other people with similar experiences of dementia. As they have found it harder to attend the café, friends from the Dementia Café now regularly visit David and Carol at home, which they really appreciate and enjoy. The Hub continues to support David and Carol, as well as their son and daughter, with relevant information and advice as Carol’s dementia progresses. Bromley Dementia Support Hub is a new service, commissioned during 2016 by Bromley Council and NHS Bromley Clinical Commissioning Group. It provides a comprehensive post-diagnosis support service for people with dementia and their carers. 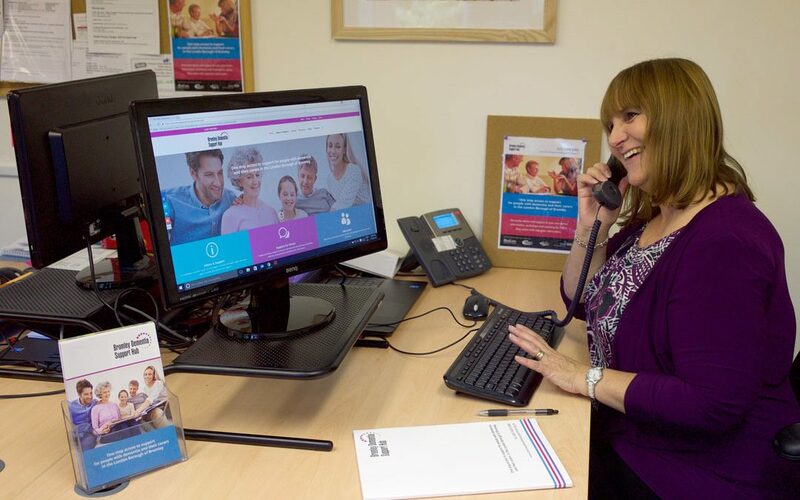 Bromley & Lewisham Mind are the lead provider, working in partnership with Age UK Bromley & Greenwich, Carers Bromley and Oxleas NHS Foundation Trust. The Hub began operating in July 2016 and by the end of March 2017, had provided information and support to 1,181 people with dementia and carers. It also took over running the very successful Memory Lane Dementia Café, which regularly sees attendances of more than 40 people with dementia and carers. The Dementia Hub has quickly become an integral part of the Bromley dementia support pathway in Bromley borough. We are proud to announce the launch of the Bromley Dementia Support Hub for people diagnosed with dementia and their carers. 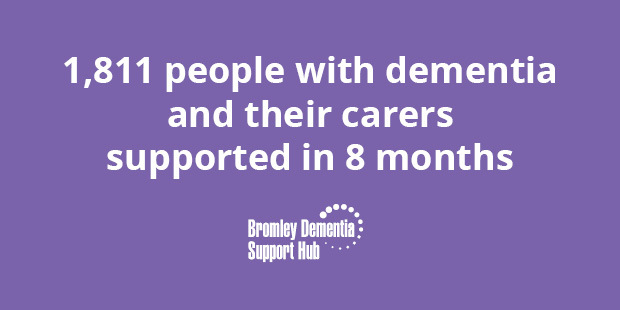 The Bromley Dementia Support hub is a local partnership consisting of MindCare Dementia Support (part of Bromley & Lewisham Mind), Age UK Bromley & Greenwich, Carers Bromley and Oxleas NHS Foundation Trust. a network of volunteer befrienders to support people with dementia to stay in their own homes and local communities. The service has been jointly commissioned by Bromley Council and Bromley Clinical Commissioning Group and will begin operating from July 2016.